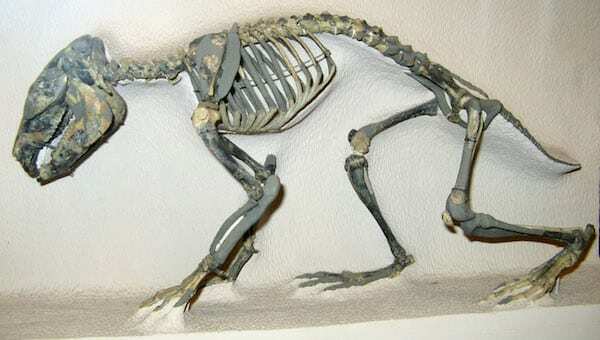 Hegetotheriids (also known as hegetotheres) were small to medium-sized mammals that ranged from the size of a rabbit (probably about 12-16″/30-40 cm ) to a beaver (about 3 feet/1 m long). 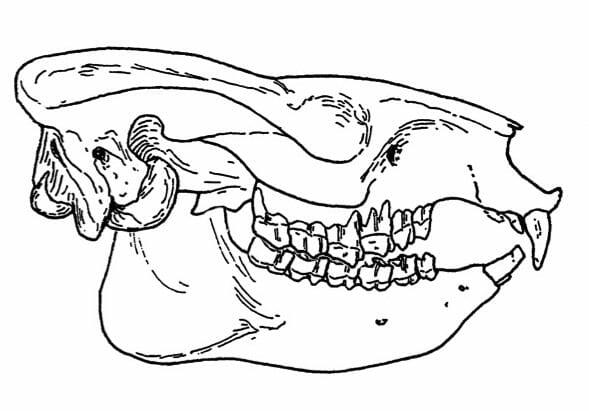 Some hegetotheres were very rabbit-like in both their skull and skeleton (pachyrukhines; see below), whereas others had proportions more similar to a large rodent such as pacarana (Dinomys branickii). They were relatively cursorial, at least for a notoungulate, and some of the smaller, geologically younger species lived in burrows (Elissamburu et al. 2011). Hegetotheres have been found at most well-sampled late Oligocene through Pliocene sites in South America but have yet to be recorded at equatorial sites such as La Venta, Colombia (Croft 2007). Whether this is due to ecological and/or biogeographic factors remains to be determined. A skeleton of the late Oligocene hegetothere Propachyrucos on display at the American Museum of Natural History in New York. For details on the specimen, see Simpson (1945). Photo by D. Croft. Reuse permitted under CC BY-NC-SA 2.0. Hegetotheres were among the latest-diverging families of typothere notoungulates. Their early fossil record is similar to that of mesotheres: the late Oligocene (Deseadan SALMA) forms are relatively well-characterized, but the fossil record of the family extends back to the early Oligocene (Tinguirirican SALMA). The earliest hegetothere specimens come from the rather mysterious site of Cañadón Blanco in Argentina (see Wyss et al. 1994; Flynn et al. 2003) and central Chile (Croft et al. 2008). They survived until the early Pleistocene, apparently going extinct slightly earlier than mesotheres; it is uncertain whether they also survived into the Ensenadan SALMA (Cerdeño and Bond 1998; Bond 1999). Hegetotheres are one of four groups of notoungulates with hypselodont (ever-growing) teeth. They are also characterized by enlarged first upper incisors that are implanted obliquely in the premaxilla, and lower teeth that have a straight lingual face. Their teeth are the most simplified of any group of notoungulates; the upper teeth of most species completely lack any fossettes or even any prominent folds, and most lower teeth have only a single buccal sulcus (which separates the trigonid and the talonid). Upper (left) and lower (right) teeth of the late Miocene hegetothere Hemihegetotherium (= Pseudohegetotherium) torresi, anterior to right. The upper teeth include right P2-M3 (MLP 55-IV-28-8); the lower teeth include left p3-m2 (MLP 76-VI-12-93). Scale bar equals 1 cm. Photos by D. Croft. Reuse permitted under CC BY-NC-SA 2.0. Based primarily on their ever-growing teeth and associated features of the skull, hegetotheres are generally thought to have fed on low-growing vegetation in open habitats (e.g, Cassini et al. 2012). Nevertheless, the high, sharply pointed edges of their teeth suggest that at least some species fed on much less abrasive vegetation (Croft 2016). Additional research on their feeding habits using methods such as mesowear, microwear, and stable isotopes are needed. Tibia and fibula of the pachyrukhine Pachyrukhos moyani (A), the hegetotheriine Hegetotherium mirabile (B), and the interathere Protypotherium australis (C). Scale bars equal 1 cm. From Croft et al. (2004:fig. 14). Hegetotheres had clearly diversified by the late Oligocene; at present, five genera date from that interval. The family has traditionally been divided into two subfamilies, Hegetotheriinae and Pachyrukhinae. Pachyrukhines include the more rabbit-like forms and are quite distinctive both cranially and postcranially. An obvious feature of the dentition that distinguishes them from hegetotheriines is the absence of canines and adjacent incisors and premolars; this results in a large gap (diastema) in the toothrow. These same teeth are present but small in hegetotheriines. 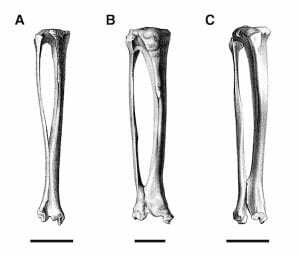 The two groups also vary in the configuration of their lower leg bones; in pachyrukhines, the tibia and fibula have a long, narrow area of fusion whereas in hegetotheriines, the area of fusion is short and broad (Croft et al. 2004). Pachyrukhines constitute a monophyletic group, but this may or may not be true of hegetotheriines (Croft and Anaya 2006; Cerdeño and Reguero 2015). Cassini, G. H., E. Cerdeño, A. Villafañe, and N. A. Muñoz. 2012. Paleobiology of Santacrucian native ungulates (Meridiungulata; Astrapotheria, Litopterna and Notoungulata); pp. 243-286 in S. F. Vizcaíno, R. F. Kay, and M. S. Bargo (eds. ), Early Miocene Paleobiology in Patagonia: High-Latitude Paleocommunities of the Santa Cruz Formation. Cambridge University Press, Cambridge. Cerdeño, E., and M. Reguero. 2015. The Hegetotheriidae (Mammalia, Notoungulata) assemblage from the late Oligocene of Mendoza, central-western Argentina. Journal of Vertebrate Paleontology 35:e907173. Croft, D. A. 2007. The middle Miocene (Laventan) Quebrada Honda Fauna, southern Bolivia, and a description of its notoungulates. Palaeontology 50:277-303. Croft, D. A., and F. Anaya. 2006. A new middle Miocene hegetotheriid (Notoungulata: Typotheria) and a phylogeny of the Hegetotheriidae. Journal of Vertebrate Paleontology 26:387-399. Croft, D. A., J. J. Flynn, and A. R. Wyss. 2004. Notoungulata and Litopterna of the early Miocene Chucal Fauna, northern Chile. Fieldiana: Geology (New Series) 50:1-52. Elissamburu, A., A. Dondas, and L. De Santis. 2011. Morfometría de las paleocuevas de la “Fm.” Chapadmalal y su asignación a Actenomys (Rodentia), Paedotherium (Notoungulata) y otros mamíferos fósiles hospedantes. Mastozoología Neotropical 18:227-238. Flynn, J. J., A. R. Wyss, D. A. Croft, and R. Charrier. 2003. The Tinguiririca Fauna, Chile: biochronology, paleoecology, biogeography, and a new earliest Oligocene South American Land Mammal “Age”. Palaeogeography, Palaeoclimatology, Palaeoecology 195:229-259. Simpson, G. G. 1945. A Deseado hegetothere from Patagonia. American Journal of Science 243:550-564. Wyss, A. R., J. J. Flynn, M. A. Norell, C. C. Swisher, III, M. J. Novacek, M. C. McKenna, and R. Charrier. 1994. Paleogene mammals from the Andes of central Chile: a preliminary taxonomic, biostratigraphic, and geochronologic assessment. American Museum Novitates 3098:1-31.